MEETING Cinderella maybe every child’s dream and The Wizard of Oz Funland, Leumeah, is fulfilling this wish with a fun and interactive version of the fairy tale. 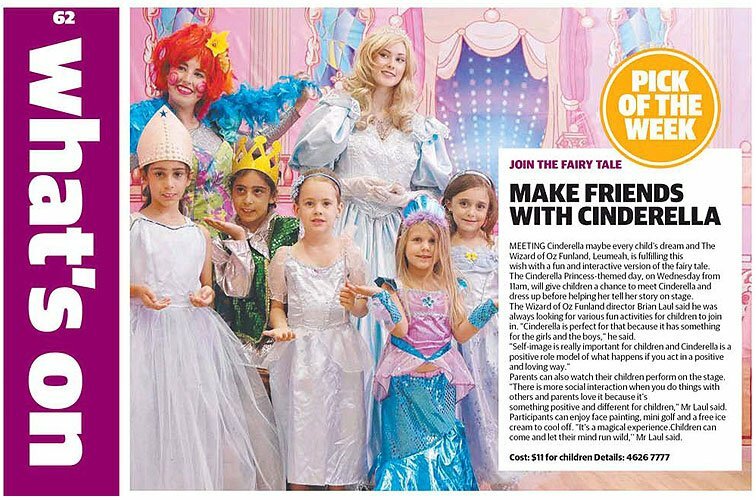 The Cinderella Princess-themed day, on Wednesday from 11am, will give children a chance to meet Cinderella and dress up before helping her tell her story on stage. The Wizard of Oz Funland director Brian Laul said he was always looking for various fun activities for children to join in. “Cinderella is perfect for that because it has something for the girls and the boys,” he said. Parents can also watch their children perform on the stage. “There is more social interaction when you do things with others and parents love it because it’s something positive and different for children,” Mr Laul said. Participants can enjoy face painting, mini golf and a free ice cream to cool off. “It’s a magical experience.Children can come and let their mind run wild,’’ Mr Laul said.